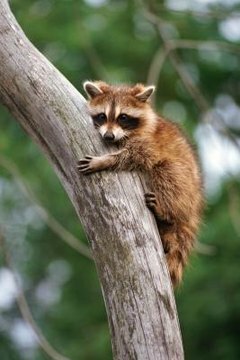 When you think of the word raccoon, you might think of the common raccoon (Procyon lotor), which is prevalent all over Mexico, Central America, Canada and the United States. These furry guys pop up seemingly everywhere, from farming sites to areas behind grocery stores. However, a couple other species of the mammals with the conspicuous black eye patches do exist, which are crab-eating raccoons (Procyon cancrivorus) and Cozumel raccoons (Procyon pygmaeus). Common raccoons who live out in nature can survive for a maximum of 16 years in age. Despite that, the majority of common raccoons don't make it to 2 years old. In those who move past the juvenile stage, however, the typical life expectancy is around 5 years in age. Captive specimens have been as old as 21 years. Crab-eating raccoons are Central and South American residents. As near kin to common raccoons, they share a lot of physical appearance. Cozumel raccoons of Mexico also have form and coloration like common raccoons'; however, they are significantly smaller and have proportionately thinner tails. These raccoons in most cases don't live for much longer than 5 years. A few specimens are believed to have lived upwards of 13 or 16 years in the wild. In zoos, they have much greater life expectancies. Many things can potentially affect the life spans of raccoons, and disease is just one of them. Common raccoons, for one, are frequently affected by hunting, poisoning and even persecution by human beings. They are also frequently struck and killed by passing vehicles. Crab-eating raccoons have similar risks. They are hunted for their furs. Loss of their natural rainforest habitat leads to consequences in their lifestyles and habits. Cozumel raccoons have their own set of hazards, including predation by canines and car accidents. Many young raccoons pass away before ever getting to the age of physical maturity. In raccoons across the board, the average age of reproductive capabilities is roughly 1 year old, indicates Animal Bytes of the SeaWorld website.